While visiting Rye The Brit and I visited a wonderful little Italian restaurant called The Tuscan Kitchen. We were a large group so rather than order from the menu we were fed what the chef thought we would enjoy. The restaurant managed to accommodate our large number although it is a small place. They provided us with warm and friendly service which we all really appreciated. There were courses and course of food served. 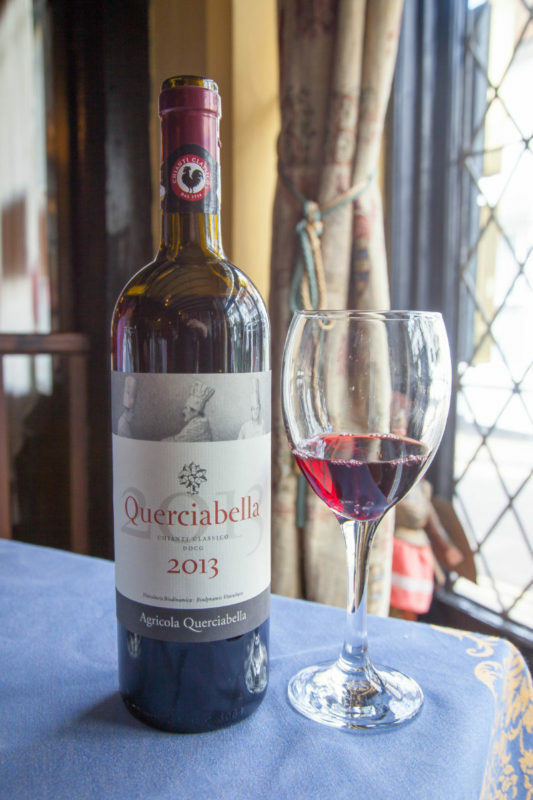 We were served a Chianti Classico a 2013 Quercibella. It was a nice easy to drink wine with medium acidity and a lot of plum flavors. The wine was flowing as freely as the food. There was also a white being served but with all of the people and conversation we never got to try a glass. 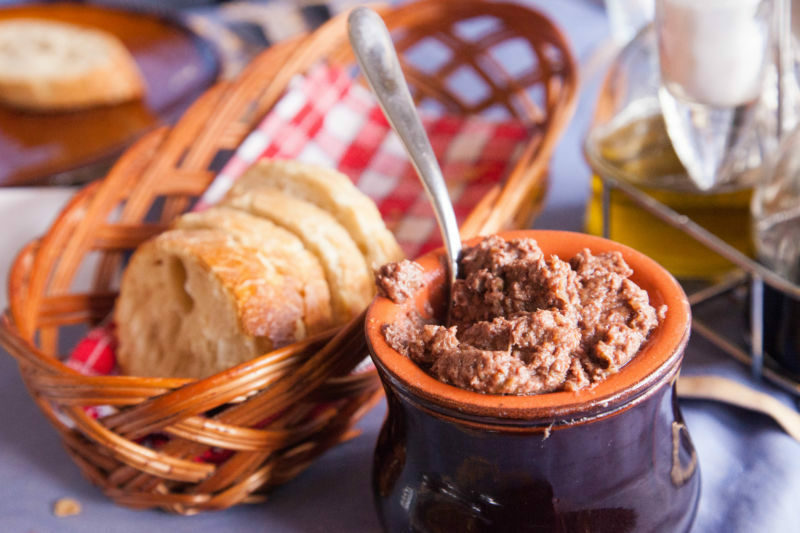 We started off our meal with warm chicken liver paté. I have never been a fan of paté but this was wonderful. The flavor was both rich and complex and the texture was smooth. Rustic Italian bread was served with the paté. It was delicious. We were then served a course of caprese salad. 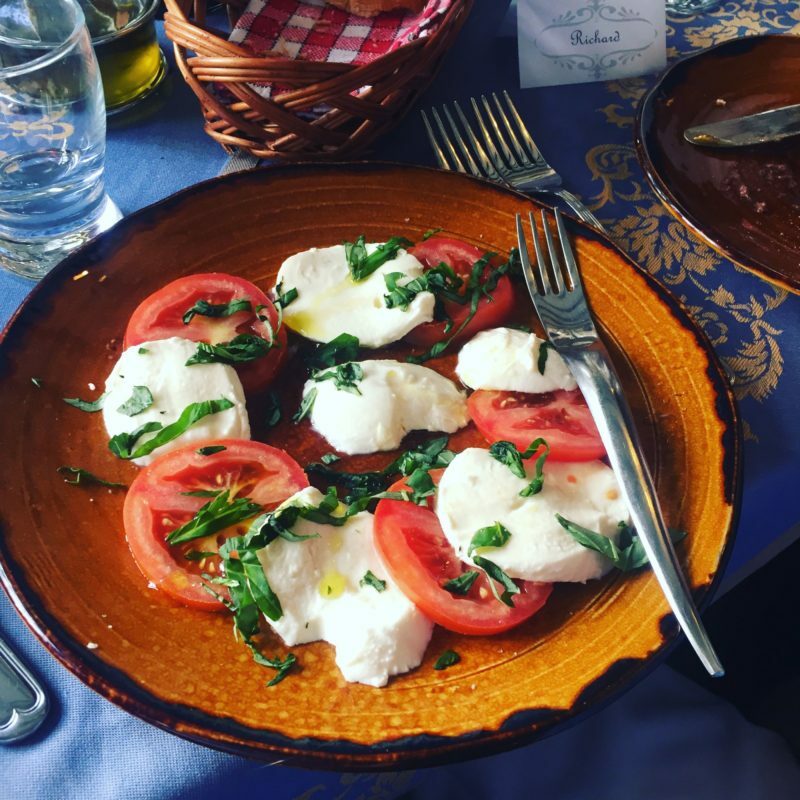 Ripe tomatoes, basil, and mozzarella served with quality balsamic vinegar and olive oil. I really enjoyed the fresh flavors of this dish. Next up was a pear and Gorgonzola bitter leaf salad sprinkled with chopped walnuts in a light dressing of olive oil and salt. The had a perfect mix of salty, crunchy, sweet and savory. 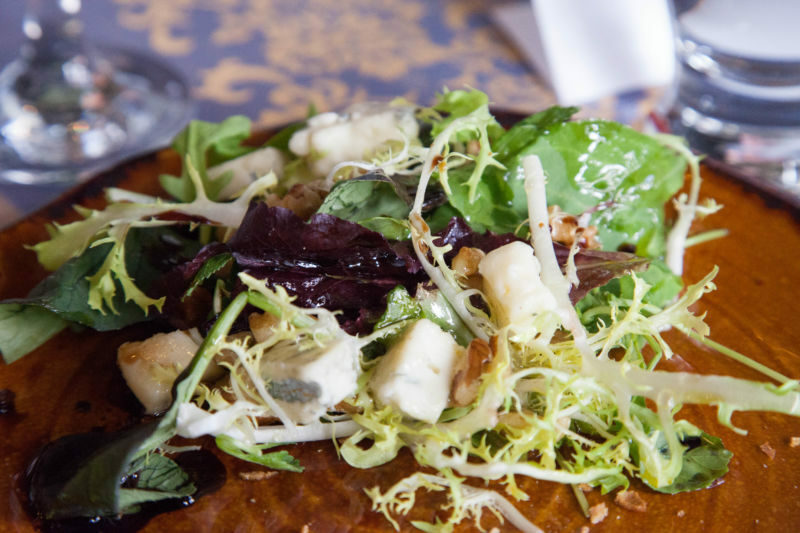 The Brit comments: This dish showed the advantage of having dishes selected for us; I would not have ordered this salad, but I am glad that I had an opportunity to taste it. 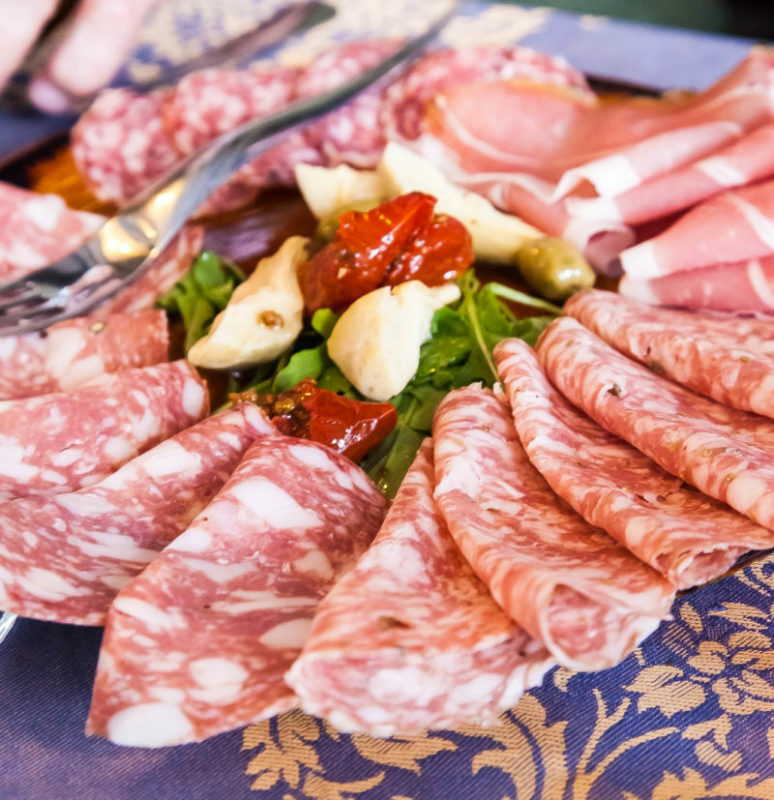 The charcuterie course was up next with slices of salami, prosciutto, roasted sun-dried tomatoes, and artichoke hearts on a bed of arugula. I truly loved the roasted sun-dried tomatoes. They had so much flavor and were great with the rest of the components of the dish. 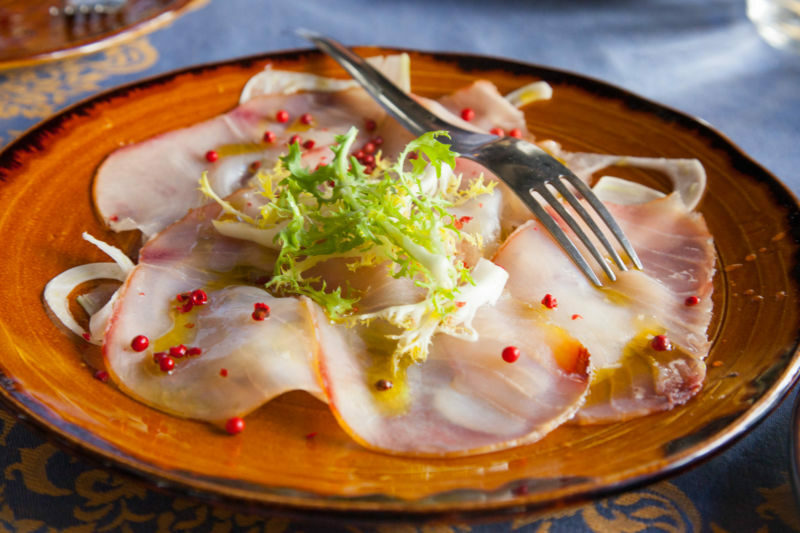 A very interesting sword fish carpaccio was our next dish. It was sliced thinly finished with olive oil and red peppercorns; it was wonderful. I had to ask what type of fish it was as it was so light and tender. It just melted in the mouth. So here is the qualifier for all good Italian restaurants: the pasta. 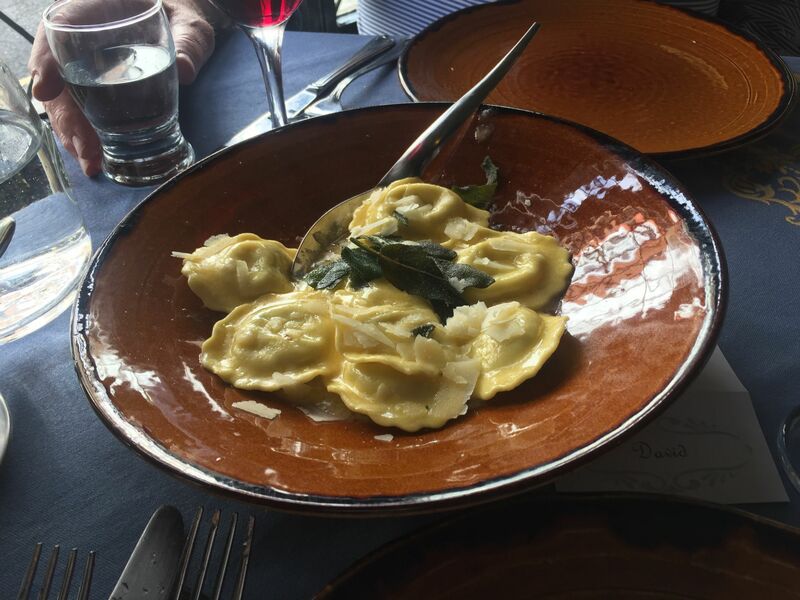 The Tuscan Kitchen served us two amazing ravioli dishes. One of them featured porcini mushrooms in a mushroom cream sauce, and the other was a sherry and cream sauce with crispy fried sage. Both were packed full of flavor; the chef should be proud. The roasted prawns with orange slices were a delight. 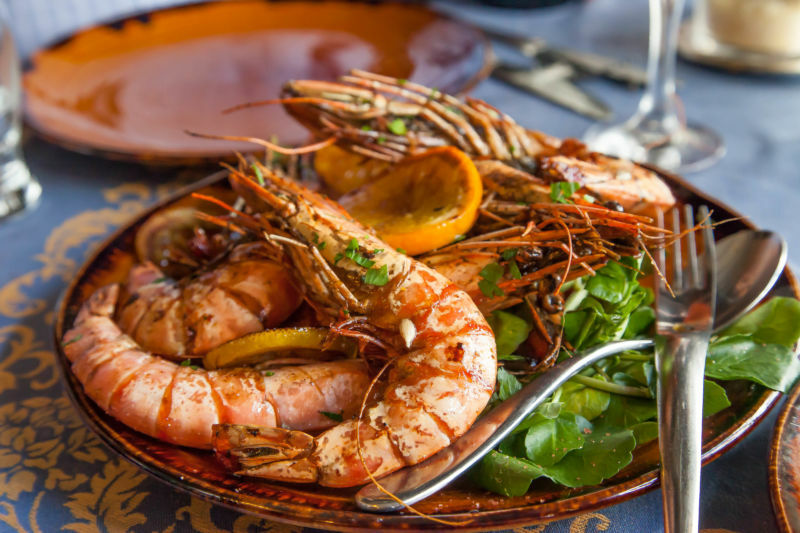 Big and meaty, these prawns would satisfy the hungriest appetite on their own. 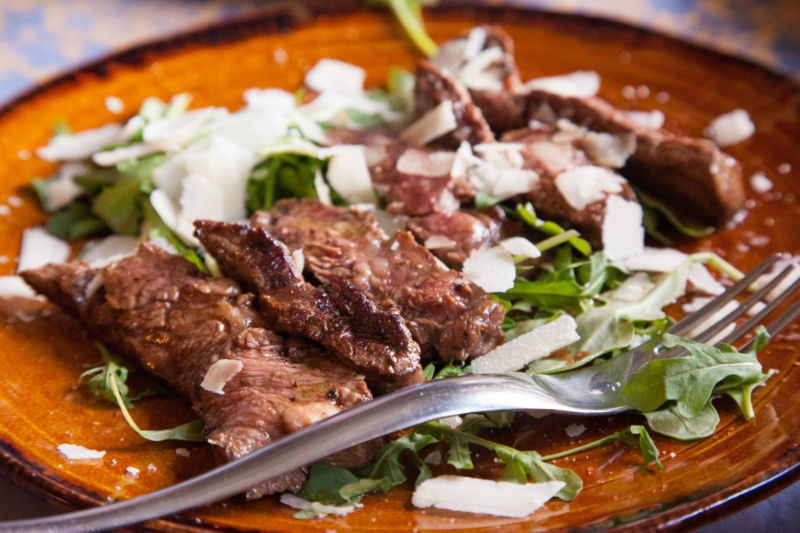 The last main course was sliced flank steak with parmesan cheese and arugula. The steak was cooked perfectly medium rare. For dessert they had several choices. Many moans of pleasure were heard around the table as people ate them. 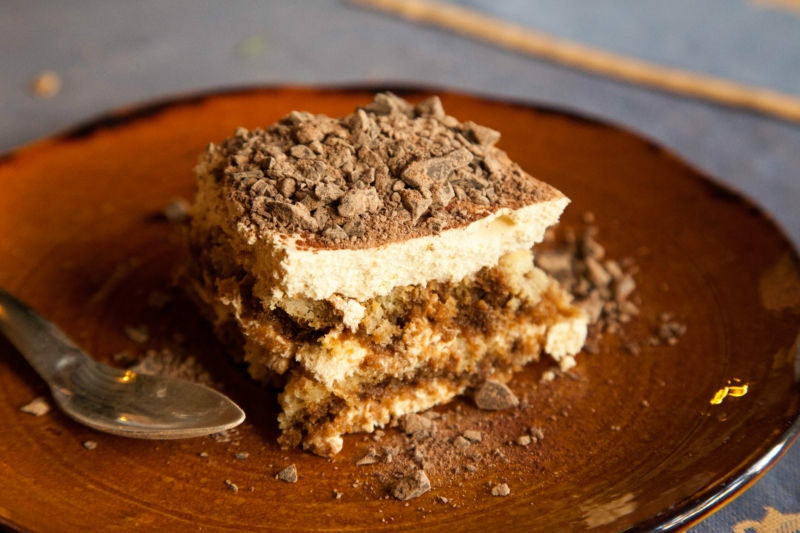 I had the traditional tiramisu. It was cake like with a nice coffee cream and a slight liquor flavor. It was finished off with chocolate shavings and powder. It was good, but there were other desserts that I liked better. The Brit had the affogato which is of course predictable with his great love of everything ice cream. 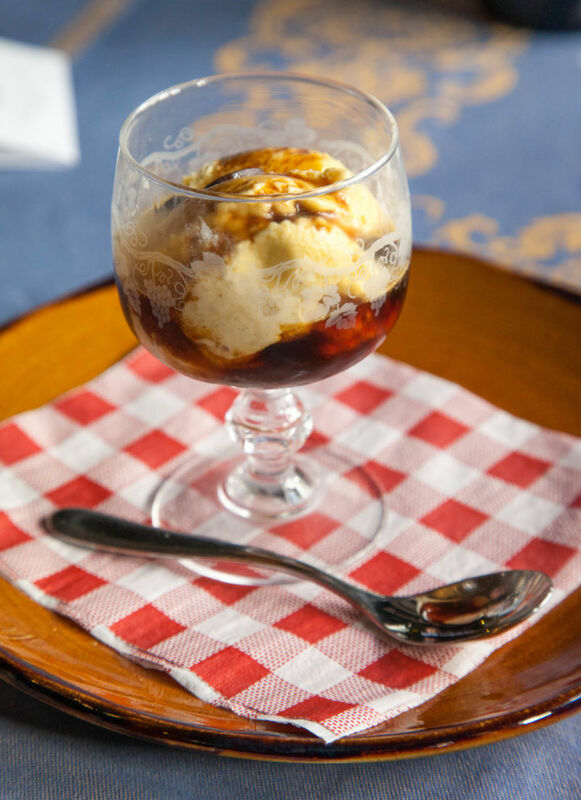 Affogato is vanilla ice cream with espresso poured over it. He seemed very happy with his choice. The Brit comments: I was surprised that the coffee used was flavoured with hazelnut. This made the dessert sweeter than I expected. I understand why this might appeal, but I prefer the dessert with regular coffee. 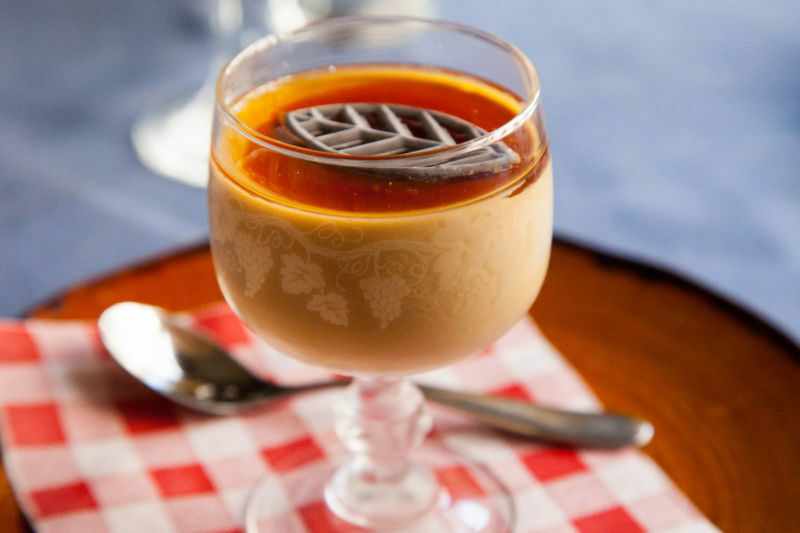 The creme caramel was the favorite dessert. I had a bite and it had a lot of butterscotch flavor to it. I don’t tend to care for this dessert, but I enjoyed the version that was served that evening. The final dessert was panacotta. This was everyone’s least favorite of the desserts. 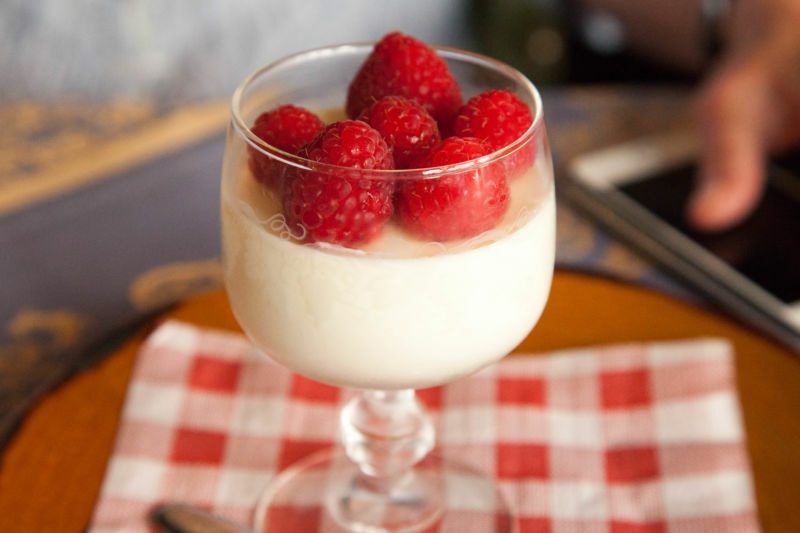 It had beautiful fresh ripe raspberries on top and a nice creamy body. It was in itself good, but everything else was better. 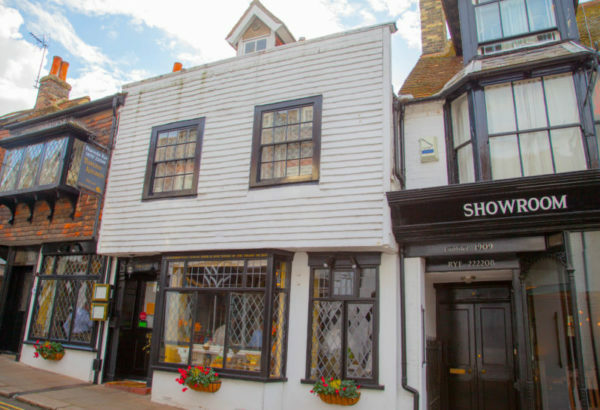 We would highly recommend you visiting The Tuscan Kitchen in Rye. Charming atmosphere, nice service, and great food.